Tara Riverboat Company, Siem Reap, Siem Reap. Information, Photos and Reviews. The Tara Boat Company has operated in Cambodia for over 10 Years and our experience and knowledge means our specialist Boat Tours offer the best way to experience the Tonle Sap Lake. Operating 365 Days a year we offer a hassle free way to explore the area and learn how the lake supports the local people. Our Safety record is immaculate and most importantly we ensure you are looked after for the duration of your chosen tour. We ensure you are not exposed to any of the scams ensuring that we look after the safety and enjoyment of every customer from collection to return to your hotel with our all-inclusive prices leaving you with nothing to worry about. We offer a range of half and full day tours in both Siem Reap and Phnom Penh to choose from to explore the lakes, rivers and floating villages to suit all needs starting from $24. Whether you choose to visit the floating village at Chong Khneas, the quieter Kompong Phluk Village and flooded forest, the little visited Kompong Khleang Village or the famous bird watching area of Prek Toal Biosphere Centre you can be sure that the Tara Boat Company will offer you a memorable trip to these special places and look after you to ensure optimum enjoyment. We also have the unique Queen Tara Boat where many of our tours stop for meals and drinks and the opportunity to relax and take in the unrivaled views the top deck offers. 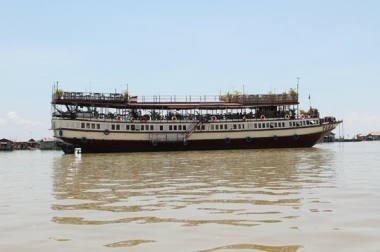 At over 41 meters in length the Queen Tara is the biggest boat on the Tonle Sap Lake. It provides lots of space to relax aboard with our professional Tara Staff to look after you. It’s also the perfect place to come to see the sunset on our always popular $36 Sunset Tour which includes a full buffet selection plus unlimited drinks including cocktails and of course the best view to watch the sun go down on the lake. We have a strong reputation and are, amongst others, recommended by Lonely Planet, Travelfish, TripAdvisor, Viator, GetYourGuide, Roundtheworld and Le Routard as well as many independent travel blogs. To ensure that each and every customer has a safe, enjoyable and unique travel experience... to promote best practice and sustainability through training and education of our most valuable asset, our employees. Please note certain tours require a minimum 2 people per booking. Please check our website for details. All our tours are the price advertised with no additional hidden costs and include: - pick up and return from hotel/guesthouse in Air Conditioned Company Mini Vans - all transfers - fully experienced local English Speaking, Professional Tara guide, safety conscious Tara drivers on our mini Tara boats - all check point fees - meals and drinks (unless otherwise stated). Please see our website for details. The Queen Tara, the biggest boat on the Lake. Curry Walla - Siem Reap (0.9 miles) - Serving wide range of Indian and Cambodian food. Namaste Taste of India - Siem Reap (0.9 miles) - Serving Vegetarian and Non-vegetarian authentic Indian dishes. Namaste Spa Siem Reap (0.9 miles) - Providing Massages, Henna tatoo, Scrub, Waxing, facial Massage and hair treatments etc. Nobody has reviewed Tara Riverboat Company yet, Be the first. You are submitting a booking enquiry. Tara Riverboat Company will then contact you by email with details of availability and prices.